Time is a river / Graeme Koehne. Recorded/performed at: Federation Concert Hall, Hobart, on 2014. 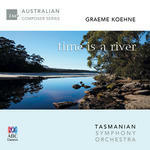 Graeme Koehne Tasmanian Symphony Orchestra, Richard Mills 26 mins, 34 sec. Recorded/performed at: Federation Concert Hall, Hobart, on 2014. Graeme Koehne Tasmanian Symphony Orchestra, Richard Mills 6 mins, 43 sec. Recorded/performed at: Federation Concert Hall, Hobart, on 2014. Graeme Koehne David Nuttall, Tasmanian Symphony Orchestra, Richard Mills 9 mins, 47 sec. Recorded/performed at: Federation Concert Hall, Hobart, on 2014. Graeme Koehne Tasmanian Symphony Orchestra, Paul Dean, Richard Mills 16 mins, 55 sec. The disc opens with the joyous fanfare Forty Reasons to Be Cheerful, commissioned for the 40th anniversary of the Adelaide Festival Centre and inspired by the open-hearted optimism of Beethoven's 'Ode to Joy'. The short elegy The Persistence of Memory is a haunting and poignant tribute to Guy Henderson, former principal oboist of the Sydney Symphony Orchestra, a work inspired by what Koehne describes as a "language of emotions". "Music is part of how we communicate: it's what humans do - not an abstract series of sounds. [This piece] reflects an attempt to return to the fundamental elements of musical 'language'." Divertissement: Trois Pièces Bourgeoises expresses Koehne's desire "to give simple pleasure to my fellow-citizens." Between Two Worlds is a reflective work inspired by David Malouf's novel Fly Away Peter, which traces the journey from innocence to bitter experience of a young man enlisting in the First World War; the six-movement suite is taken from the full-length ballet score commissioned from Koehne by The Australian Ballet. The album closes with Time is a River: "The string quartet is the 'river', pursuing its relentless course, by turns gentle, swirling, turbulent and free-flowing. The clarinet represents some form of persona - a soul, if you like - that is carried along by the flow of the strings, pursuing its own diverse range of characters: melancholic, reflective, playful, ecstatic, capricious, finally reaching a state of acquiescence or acceptance." This product forms part of the following series: TSO Australian composer series. Library reference copy includes liner notes include programme notes. CD is out of print & not available for purchase from the AMC. Score: Divertissement : trois pièces bourgeoises / Graeme Koehne ; transcribed for string orchestra by Bruce Stewart. Score: Divertissement: trois pièces bourgeoises, for string quartet / Graeme Koehne. Parts: Divertissement : trois pièces bourgeoises, for string quartet / Graeme Koehne. Score: Time is a river : clarinet quintet / Graeme Koehne. Parts: Time is a river : clarinet quintet / Graeme Koehne.